Mohammed al-Haj Ali was named as the first identified victim in the London fire that engulfed Grenfell Tower. London: A 23-year-old Syrian student, who had fled his war-hit country and arrived in the UK three years ago, was today named as the first victim of the west London inferno which killed 17 people. Mohammed al-Haj Ali, a civil engineering student at West London University, was separated from his older brother Omar on the stairs as they tried to escape the devastating fire that engulfed the 24-storey residential block Grenfell Tower yesterday. Mr Ali was following Mr Omar but let go after he was overwhelmed by the smoke. He returned alone to their flat on the 14th floor, where he was trapped for over two hours. He made phone calls to friends and family in Syria before sending one final message that read: "The fire is here now, goodbye", The Telegraph reported. Friends and family confirmed that 25-year-old Omar, a business student, made it out alive and is recovering from smoke inhalation in Kings Cross hospital. Abdulaziz Almashi, a friend of the family and co-founder of the UK-based Syrian Solidarity Campaign, said that Ali remained trapped with the firefighters unable to reach above the 13th floor. "He survived Assad, the war in Syria, only to die in a tower block in London. There are no words," Mr Almashi was quoted as saying by the daily. The brothers along with their family had fled Daraa in southern Syria - the cradle of the revolution against Syrian president Bashar al-Assad - three years ago and were granted asylum in the UK. UK Prime Minister Theresa May today ordered a full public inquiry into the devastating fire reported at 01:16 AM (local time) yesterday as police said there was little chance of finding any more survivors from the smoldering building. 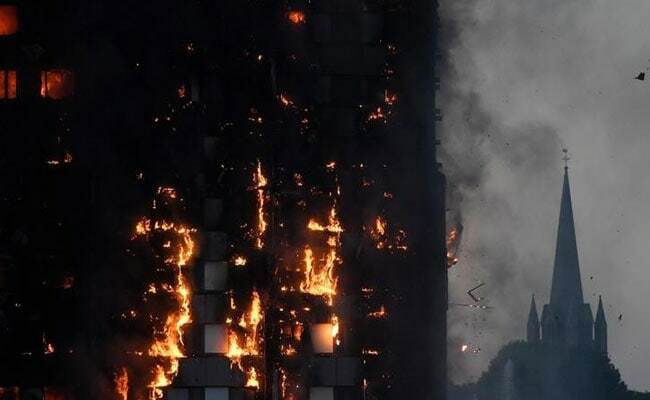 About 600 people were believed to have been inside the tower's 120 flats, many of them asleep, when the blaze ripped through the building. Nearly 78 people were injured, and 34 remain in hospitals across London - 18 of them in critical condition.